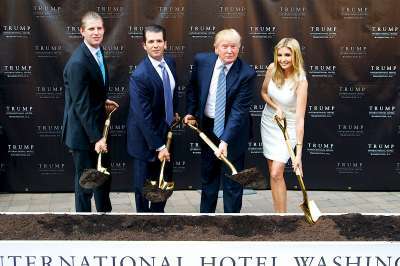 WASHINGTON—Donald J. Trump, president and chairman of The Trump Organization, and Donald Trump Jr., Ivanka Trump and Eric Trump, EVPs of development and acquisitions, broke ground on Trump International Hotel, Washington, DC, its $200-million redevelopment of The Old Post Office. Congresswoman Eleanor Holmes Norton, Mayor Vincent Gray, Councilmember Muriel Bowser, Ward 4, Council of the District of Columbia; and Commissioner Norman Dong of the Public Buildings Service for the United States General Services Administration, joined the Trump family to celebrate the occasion. The property’s transformation is scheduled to be complete in 2016, when it will become the newest addition to the Trump Hotel Collection. It will offer 270 guestrooms and suites averaging more than 600 sq. ft., many with 16-ft. ceilings. In addition, two Presidential Suites will be located in the historic former offices of the Postmaster General. The suites will feature an oversize master bedroom suite with windows on three exposures offering views of The Capitol and The Washington Monument; a formal dining room with original fireplace; a pantry/kitchen for use by dignitaries during extended stays; a service entry; walk-in closets; exercise room; and a two-person shower and steam room. Trump International Hotel, Washington, DC will offer a total of 36,000 sq. ft. of meeting and event space, including the 13,000-sq.-ft. Grand Ballroom. Trump Hotel Collection will reinstate the 11th St. entrance on Pennsylvania Ave., which will serve as the driveway to the hotel’s canopied grand entrance. The property’s ground level will include restaurants and luxury retailers located at both corners of the building on Pennsylvania Ave. The hotel also will offer a 5,000-sq.-ft. spa and fitness center.